Hi everyone, thought I would pop by and show the three cards I made for the preview days for Hello Bluebird last week. All the products are available to purchase now and the link is down below to the store. 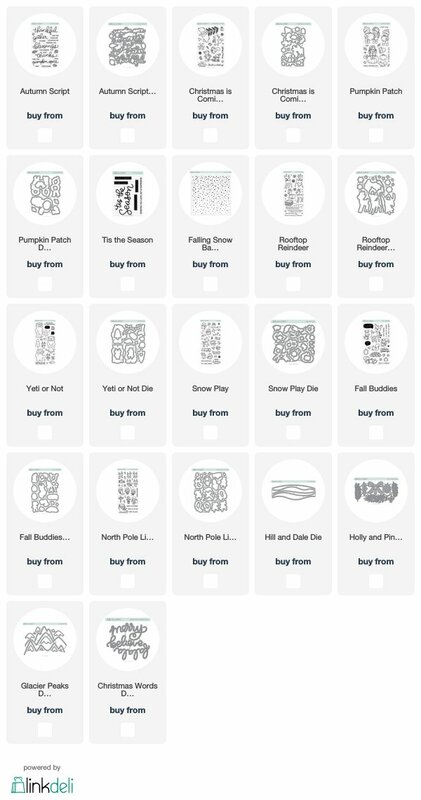 I also have an entire link up at the bottom of my post for all of the brand new products. For my first card I used the new Tis' The Season stamp set. 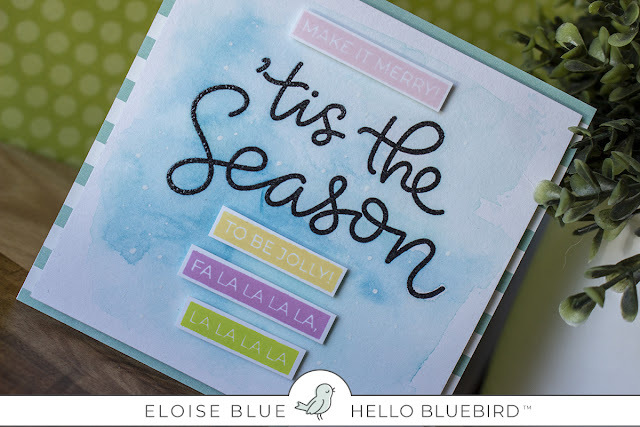 I watercolored a blue background and stamped the large Tis' The Season sentiment with black ink on top. I drew some dots for snow in the background as well. For the additional sentiments I used some pink, yellow and green inks to stamp them and cut them out leaving a white border. I popped them up on foam tape around the original sentiment. Lastly, I adhered the panel onto some blue striped patterned paper. For my second card I used the Autumn Script and Pumpkin Patch stamp sets. I coloured my image from Pumpkin Patch using my Copic Markers and cut her out with my scissors. For the background I used some yellow and green Distress Inks to create the background. I flicked it with water and heat set it. I popped up the image on foam tape and adhered it to the background. For the sentiment I used 'Give Thanks' from Autumn Script and stamped it in black on the background. Lastly, I popped the entire panel on foam tape and onto a striped piece of patterned paper. For my third and final card I used the Christmas Is Coming stamp set. I used some black watercolour and coloured over a piece of white cardstock. I dried it super well with a heat tool and then white heat embossed the bear image onto the background. I used some Kuretake Starry Colours and Pearl Colours for the colouring. 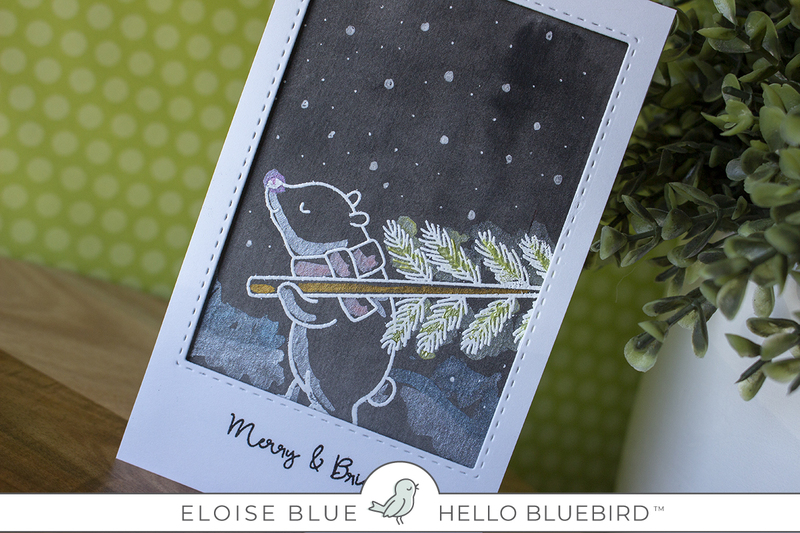 I then used a piece of white cardstock and cut a rectangle from the top centre and stamped the 'Merry and Bright' sentiment onto the bottom. Lastly, I popped it up on foam tape and adhered it over my scene. Thanks so much for stopping by today, I hope you enjoyed and are inspired by the new release. I can't wait to play with it more! All the links are down below, and I'll see you soon.